September 5 is the National Cheese Pizza Day. It is the perfect occasion to indulge yourself with a slice or two of delicious cheese pizza. The modern pizza originates in Italy. The classic Pizza Margherita was made with only three ingredients: tomato cause, mozzarella cheese, and basil. 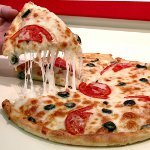 Today, hundreds of different pizza toppings are used, but classic cheese pizza is still extremely popular. Mozzarella is not the only cheese that can be used as a pizza topping. Other popular pizza cheeses include Parmesan, cheddar, and provolone. Romano, Emmental, and ricotta can also be used. Mass-market pizzas are often made with less expensive processed cheeses. Processed pizza cheeses are required to melt well and remain chewy. To celebrate the National Cheese Pizza Day, go out with your family and friends and feast on a cheese pizza. You can also order takeout or make your favorite pizza yourself. Let us learn how to make an easy cheese pizza. Roll out prepared pizza dough into a 12-inch circle and brush with 2 tbs olive oil. Place it on a preheated baking sheet and bake on bottom oven rack at 500 °F for 8 minutes. Remove from oven and spread 1 cup prepared pizza sauce. Top with 2 cups shredded mozzarella cheese and sprinkle with 1/2 cup grated Parmesan cheese. Bake on middle oven rack for about 10 minutes.